It’s no secret that most workers spend a significant amount of their time in meetings. In fact, the average UK employee attends around 3.7 meetings each week. They spend just over 1 hour preparing for these meetings and about 1 hour 22 minutes in the meetings themselves; every week, office workers are spending more than one working day preparing for and attending meetings. So it stands to reason that the look and feel of a meeting room should inspire staff members and keep them engaged. At LABS, we understand the importance of good meeting room design; after all, it can leave an impression (good or bad) on staff and clients alike. How you harness the space is crucial in determining whether people generate fresh ideas or get distracted. Before booking a meeting room, you’ve got to identify the needs of your team and the reasons for your meeting. What are you hoping to achieve and how will the room help to facilitate this? Do you need a large, functional space to entertain clients or would the meeting benefit from minimalist surroundings? Think about location; how are your attendees actually going to get to the meeting? Is it close to public transport? And if they’re located elsewhere, what technologies will you have to rely on to make sure it goes smoothly? At one stage, meeting rooms were bare spaces with little more than a large table and a few chairs in the middle of them; today, they’re anything but basic. We’ve already spoken about how technology is changing the way we work; when it comes to meetings – whether internal or external – the same applies. Here are just some of the ways that modern meeting rooms (including our own) are designed to inspire creativity and collaboration (read: productivity) in employees. Technology has made it easier than ever for individuals to work away from the office – and attend meetings without being in the room at all. 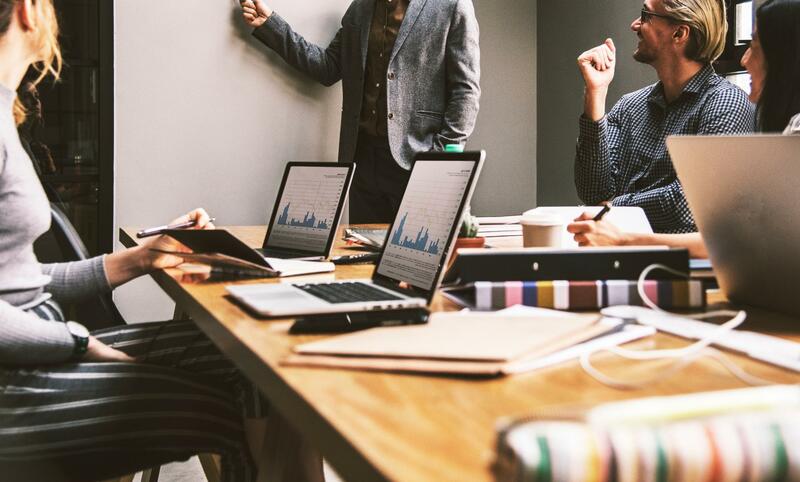 Thanks to video conferencing equipment, screen sharing and wireless connectivity, employees can get just as much from a meeting without having to make the journey in. This is especially useful if you’ve got clients who can’t easily access your offices; they could be located in another part of the UK, or even in another country. Screen sharing encourages collaboration between attendees and enables speakers to share presentations without having to email it to everyone in the room (we’ve all been there!). This saves time and helps to keep everyone focused, allowing for a more productive outcome. What’s more, there’s a growing belief that flexibility in the workplace positively impacts the mood, behaviour, motivation and lateral thinking (or creativity) of its employees. Modern meeting rooms are designed with this flexibility in mind; they’re less about containment and more about open, fluid and fair communication between stakeholders. The humble notebook was always a staple of meeting rooms; watching a group of workers scribbling away with their heads down was part and parcel of the experience – but it wasn’t the most collaborative. Nowadays, whiteboard walls make it easy for everyone in the room to share their ideas and generate new ones together; say goodbye to passive note-taking (or mindless doodling!). By their very nature, walls you can write on – like the ones found in our Camden and Holborn meeting rooms – are a great way to promote teamwork amongst employees, no matter how large or small a company may be. Traditionally, meeting rooms and offices were all about formality. Hard-backed chairs and cool colour schemes gave these spaces a conservative feel that reflected the corporate nature of business back then. Today though, many companies want to get away from that, and modern offices have become more personable as a result. That’s not to say that workplaces are a free for all; instead, they’re all about nurturing creativity with some homely touches. Comfortable seating, light-filled rooms and plants bring a sense of personality – and creativity – to the workplace. When it comes to meeting rooms, it’s not enough to offer just four white walls and a boardroom table if you want to keep your employees happy and engaged. In fact, workplace innovation consultant Kursty Groves asserts that these touches – especially those that bring the outside in – are paramount in assuring employee satisfaction. She says ‘sunlight, fresh air and natural surroundings positively affect people’s sense of wellbeing and happiness.’ And she’s right; research has shown that office workers experience lower levels of stress and mental fatigue when nature is present. Since many offices now adopt an open-plan layout, it’s not surprising that smaller meeting rooms, booths and pods have become so popular. These meeting spaces offer privacy and quiet without compromising the spaciousness of the main work area. Modern touches, like floor-to-ceiling glass walls, allow light to flood in; comfort seating and air con prevents them from becoming stuffy. If workers feel free to move around, they’re likely to become more motivated. Whether they’re getting up for a coffee or nipping to the restroom, open spaces – with strategically placed meeting rooms – will stop them from feeling as though they’re tied to their desks for the whole day. Movement is a vital component of any workforce; employees feel more alert after taking a brief walk from their desk. In Google’s New York Headquarters, there’s a rock climbing wall to combat inactivity. There’s a lot more to meeting room design than meets the eye. A 2018 survey, carried out by Crowne Plaza Hotels & Resorts, found that the average UK employee wastes nearly 13 working days every year in unproductive meetings. The same survey also found that employees got more enjoyment out of meetings that felt relaxed or that were held off-site. There’s certainly evidence to suggest that workers – and businesses – can benefit from well-designed meeting rooms that cater to the needs of modern companies and their staff.